People often fall into what I call the linear success trap. We think of success like the stock market. It goes up and down in increments. Our minds typically think that success in sports is the same. Teams gradually improve and then become good. They get to the playoffs, win a championship and then gradually decline. The reality is quite different. Success and failure isn’t linear. Every year we see teams seemingly coming out of nowhere to win and go away. The 1993 Phillies and 2003 Marlins disappeared as fast as they won. The 2006 Mets never returned to the postseason. The 2017 Twins came out of no where to reach the postseason just to return to nowheresville. In a previous article, I explained how the Braves went into rebuild mode after they collapsed in the second half of 2014. They made numerous trades that netted them lots of talent. However, they really stepped up their game with regards to international signings. The Braves picked up Ozzie Albies (Curacao), Johan Camargo (Panama) and Ronald Acuna (Venezuela) via international signings. They traded for number 1 overall pick Dansby Swanson. The everyday core of this team is young, fast and athletic. Atlanta was one of the most fun teams to watch. Camargo, Albies and Acuna led the young core of international signees. While the starting lineup was getting a lot of attention, the pitching staff was one of the best in baseball. Mike Foltynewicz had a breakout season while Anibal Sanchez had a career year. Arodys Vizcaino built off his 2017 success in the closer role. The rest of the bullpen was tough as nails. Jesse Biddle, AJ Minter, Dan Winkler and Shane Carle all pitched nicely. Moving forward, Atlanta has no shortage of young talented players who didn’t even play such a big role this year. Max Fried, Touki Toussaint, Mike Soroka, Luiz Gohara and Chad Sobotka are all talented pitchers who could be key parts of the future despite having limited roles in 2018. They still have one of the top minor league systems with ten guys on the top 100 list. One noteworthy player is Austin Riley. The young third baseman slashed .282/.346/.464 in 75 AAA games. He will likely start in AAA but should see some action in 2019. What we see here is intriguing. The Braves starting 8 were playing almost every game and producing. The only hiccup was the Acuna injury. This is not something that they should bank on in 2019. Only five MLB players played in all 162 games. The Braves had two of them. (This count excludes Bellinger and Machado of the Dodgers who played in 162 out of 163 games.) The same can be said about the rotation. The Braves had three starters make 30 or more starts. In addition, Kevin Gausman was great after being nabbed from the Orioles and is still under team control. If the Braves want to insure success in 2019, they need to realize that the odds of Nick Markakis, or his replacement, playing in every game is highly unlikely. They will need more offensive depth. They have Adam Duvall as their best power threat, but after a horrific 2018 campaign, he may be non-tendered. Charlie Culberson was very good, but he is entering his age 30 season and hadn’t played much before last season. They will likely make some under the radar free agent moves. Don’t expect anything splashy. A solid veteran presence in the clubhouse could go a long way. Markakis and Freeman played everyday. 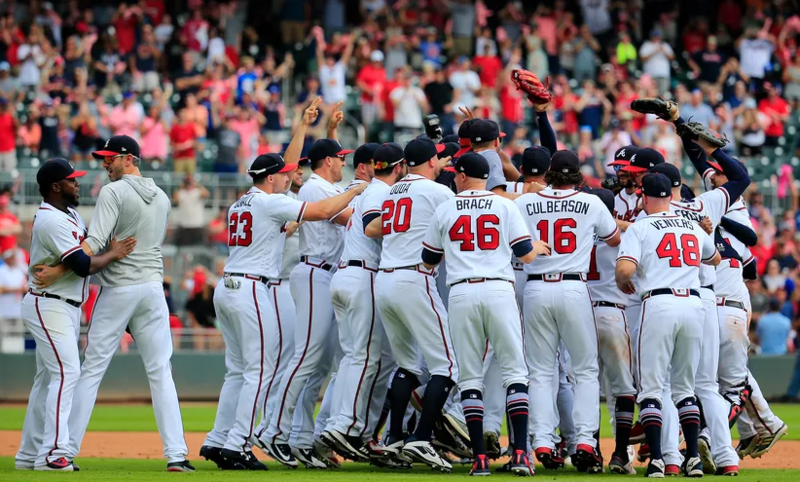 Can the Braves expect this in 2019? The Braves are clearly a threat. The years of rebuilding have finally paid off. They shouldn’t be too discouraged about the poor postseason showing. Anything can happen in a short series. However, they now have targets on their backs. Everyone will want to dethrone them, and they now are tasked with making sure that they have sustained success. Next Mets fire hitting coach Pat Roessler, more moves to come.